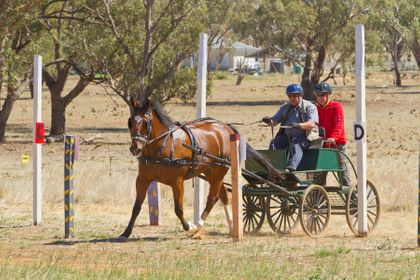 Combined Driving is carriage driving's answer to eventing. It is comprised of three sections: dressage, the marathon (including roads and tracks and obstacles (in lieu of jumps!)) and cones (the equivalent of showjumping). It can take place over 1, 2 or 3 days and can be outdoors or indoors. Competition A - Presentation (A1) and Dressage (A2) In Presentation the whole turnout, horse, vehicle, harness, driver and groom, is judged. Driven Dressage, is similar to ridden dressage, with specific movements performed in an arena. 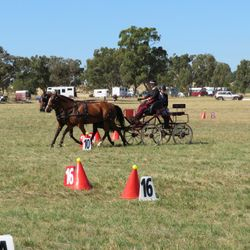 Tests require the driver to display control through voice, whip and reins, and the horses must display obedience, impulsion and correct paces. Competition B - The Marathon or Cross Country Many consider this is the most exciting phase of the overall competition. 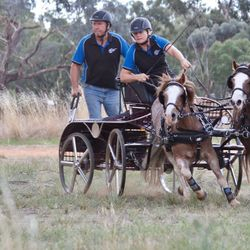 Horses need to be fit to cover the distance of up to 22km in the required time. The course is divided into five timed sections A - E, and includes two walks (Secs. B & D) of approx. 1km and a fast trot section (C). Each height class has different times for each section and time penalties may be incurred. Section E includes up to 8 man-made or natural obstacles (including water) which are gated using letters from A-F and can be driven in various ways, within a set time, as long as the gates are passed through in order. 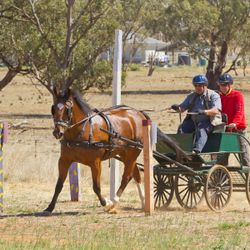 Competition C - Cone Driving The Cone Driving is designed to test the fitness, obedience and suppleness of the horse or pony after the rigors of the Marathon along with the skill of the driver. Refer to the Publications Page for the rules, TPR and Organisation Manuals.